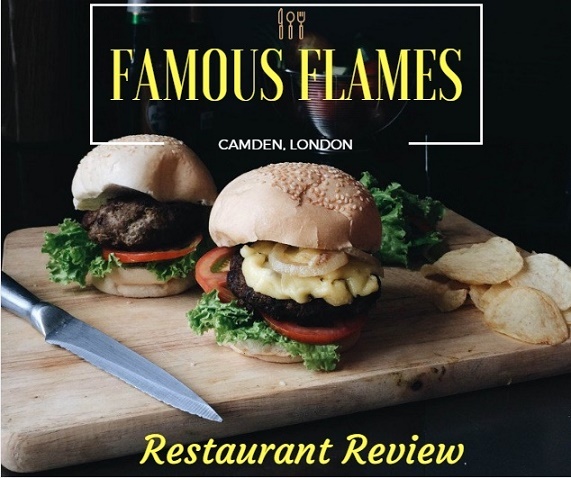 Located opposite the entrance of the Camden Town underground station, The Famous Flames is a burger joint that sells fast food such as burgers and sandwiches, wings, sides and drinks. It's located outside the congestion zone of London and parking is easily available nearby. Although it's paid in the mornings but it's free 6:30 pm onward. The restaurant has recently updated their menu and is now serving burgers with the Martin Potato roll buns. The Famous Flames in Camden is a venture of Bea Vo, also the founder of Stax Diner and Boondocks. As mentioned earlier, the menu includes fast-food and the restaurant specializes in flame grilled burgers and so that's what I sampled there. I ordered the Famous Flames cheese burger (£7.5) & Honey Habanero Chicken sandwich (£6.5) along with the waffle fries and cheesy waffle fries. The Famous Flames burger had a grilled beef patty on a Martin’s Potato Roll bun and some lettuce, tomato, mayonnaise and American cheese. The chicken sandwich tasted good too, and the sauce inside was what actually kicked off the flavour. Also tried General Tso's chicken wings (£5.5 for 6 wings), those were great and actually had a Chinese touch in them. The idea of introducing waffle fries is great but the cheese on the cheesy waffle fries didn't compliment very well according to my taste. The restaurant is great if you're looking to grab an 'on-the-go' meal or even if you want to stop by for a quick-bite. They have placed high tables with stools to accommodate those who want to sit inside and eat. Which burger joint is your favourite & which burger do you like the most? All the images & video are the property of Blogs by FA. Thanks for sharing this was a wonderful review of the restaurant. Alhamdulillah for HALAL! The burgers look absolutely mouth watering... Thanks for the review... Honey Habanero seem like a superb combination of sweet and spicy. Oh my goodness! This looks like a place my husband and I would've gone to! We both love tasting new burgers, there are lots here in California of course...only a few are very good. I hope we'll get the chance to visit abroad and eat here! Mmmm that burger photo looks mouthwatering! Il have to check this place out maybe after Ramadan!